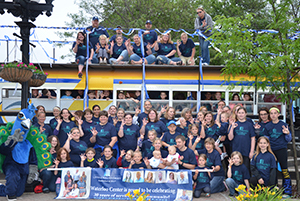 The UIU-Waterloo Center will be participating in the My Waterloo Days parade in Waterloo, Iowa, at 6:30 p.m. Friday, June 9. UIU looks forward to continuing this University tradition of celebrating the UIU-Waterloo Center and Peacock pride. All UIU alumni, along with faculty and staff and their families are invited to be part of this tradition. Participants may climb aboard the Peacock bus or walk along the parade route to show off their school spirit. Those who participate will receive a free T-shirt. For more information or to sign up, please contact Rachelle Kidwell at 319.232.6980 or kidwellr41@uiu.edu.